Apple has some of the smartest and most experienced experts searching for problems in its software —and most of them don't work for the company. Somebody, somewhere will find a problem, and the only question is what they will do with that information. That's not how it's meant to be. Officially, Apple has had what it calls a bug bounty program since 2016 —and it should be simple. If you find a serious bug in Apple's software, the company will pay a reward. That's it. Yes, there are going to be issues over whether you found it first but admin aside, it's straightforward. Yet, we're three years into the bug bounty and this week Apple made television news by —shock —actually paying it out. And perhaps they only did so because of that news reporting. If this had gone another way, if Apple had accepted the bug report, acted on it right away and announced in a more timely fashion that it would pay for the kid's college education as a thank you, the company would be a star. Yes, everyone capable would be leaping on the bandwagon and trying to find a bug to tell Apple —but that is precisely what they should want. And, the researcher isn't sharing the specific details with Apple, beyond a demonstration of the fact that it works —because of the obtuse bug bounty program. It sure would be better if Apple had all the details here. Certainly, the researcher is holding out which is part of the problem, but the reason why it is being held back is pretty telling. Unless you spend your time figuring out synonyms for bugs and problems —forget bounty, money, reward —then the only way to find out how to report a bug is via a Google search. 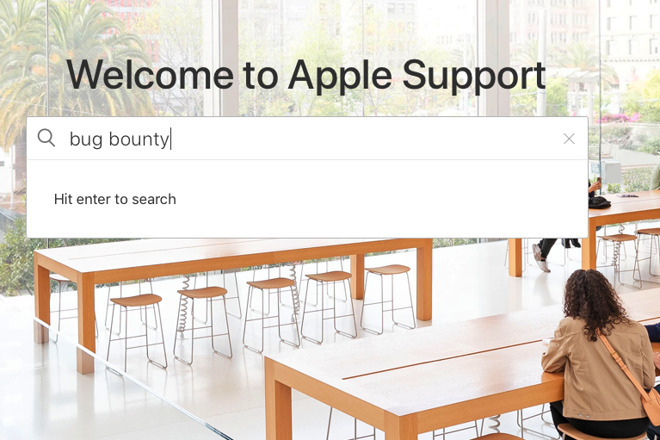 If you instead go to google.com and search "bug bounty at apple.com" then you'll find it.